Metabolism refers to all the chemical processes that occur within an organism. Metabolism is what allows our bodies to break down food energy into the types of energy we need to think, repair and grow new tissues and to move our muscles. The principle that explains this big process is called The First Law of Thermodynamics, and it states that energy is neither created nor destroyed, but simply converted from one form to another. Now, let’s take a look at The First Law in action. The sun produces radiant energy in the form of UV or ultraviolet light. When the UV light hits plants, the chlorophyll in green plants uses that energy to drive chemical reactions in the plant cells through a process called photosynthesis. Photosynthesis essentially harnesses the energy of sunlight to convert carbon dioxide, water, and minerals into organic compounds and oxygen. So in essence, photosynthesis is the fundamental process that maintains life on Earth because without plants, animals could not survive. In this animation, radiant energy from the sun is driving the reactions in grass cells to create and store starch molecules. Starch is really just a bunch of glucose molecules stuck together. Glucose is a simple form of sugar so you can imagine that starch is a rich stored energy source. The First Law of Thermodynamics is again applied when animals eat plants. Here, a cow eats the grass, and the cow’s cells go to work, breaking up the starch molecules into their smaller glucose components. The glucose undergoes another round of energy conversion, and the energy from the glucose is used to grow new cow cells and to make milk. When humans consume the meat or the milk from the cow, the First Law is applied again, and the food is digested. During digestion, food is broken down into carbohydrate, fat, and protein molecules. These molecules are further broken down into individual atoms of carbon, hydrogen, and oxygen. Proteins are the only molecules that also contain nitrogen atoms. Once the food is broken down into individual atoms, The First Law once again describes the process where atoms are combined to make new tissues and usable forms of energy necessary to keep a human alive, healthy, and active. . The chemical energy produced from the food we eat is stored as adenosine triphosphate, or ATP in our cells. The process of transferring the energy stored in the chemical bonds of food into the chemical energy stored in the bonds of ATP is called cellular respiration, or cellular metabolism. ATP is the ultimate energy goal of aerobic and anaerobic metabolism and is the only type of fuel our cells can use to contract muscle, digest food, grow and repair tissues, and keep the brain alive. ATP can be made from carbohydrates, fats, and proteins, but they are not used equally by the body. Let’s look more closely at how our cells make ATP from the food we eat. The most important forms of the three macronutrients our bodies can use to make ATP are glucose from carbohydrates, fatty acids from fats, and amino acids from proteins. Carbohydrates are broken down to ATP in the cytoplasm of the cell through a process called glycolysis, while fats undergo beta oxidation and proteins undergo oxidative deamination or transamination. 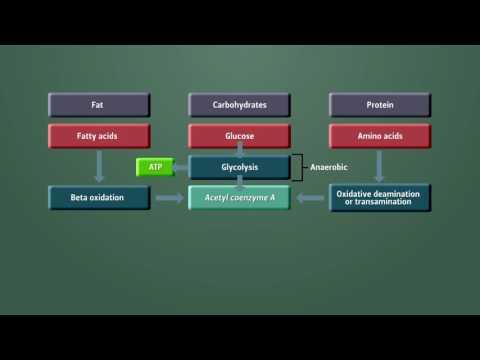 While a small amount of ATP is formed during glycolysis of carbohydrates, the major purpose of glycolysis, beta oxidation, and oxidative deamination or transamination are to serve as preparatory steps for the formation of acetyl coenzyme A. Acetyl CoA is the universal intermediate in the metabolism of carbohydrate, fat, and protein. Once acetyl CoA is available, it enters the mitochondria of the cell and the metabolic pathway can continue. What happens next is the same, no matter which type of macronutrient we began with. The amount of ATP produced from acetyl CoA is much greater than produced only from glycolysis, largely because this is an oxygen-dependent process while glycolysis is not. Each of the stages in the formation of ATP, including glycolysis, formation of acetyl CoA, Krebs cycle, and the electron transport system and oxidative phosphorylation, consist of a series of steps. Each step produces a small chemical change to a macronutrient. These sequences of steps are important, because they allow energy from food to be released gradually. If all of our food energy was released at the same time, most would be released as heat, which would destroy our tissues. .